How does one promote recycling? As the adage goes, with great powers comes great responsibility, the SM Supermarket is leading the pack in promoting the use of reusable bags that will lessen the use of plastic and increase the company’s green image as well. 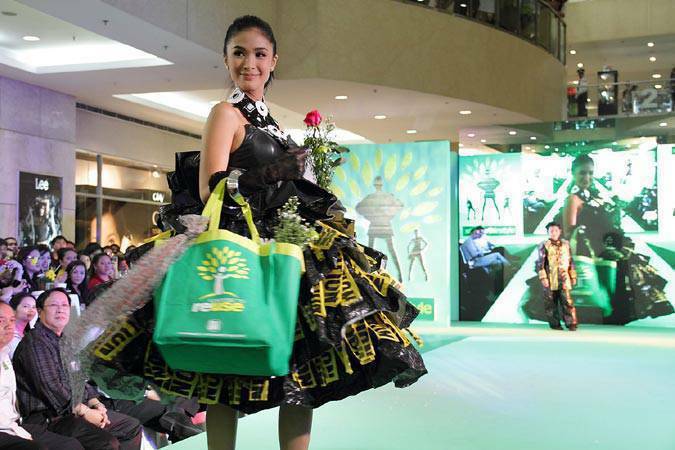 Launched in 2007, the SM Greenbag is now synonymous with environmental-friendliness. The reusable bag is the brainchild of Herbert T. Sy, President of SM Supermarkets, which allows shoppers an option aside from the plastic bags. From the reusable bags, SM Supermarket has expanded its campaign to include the MOB (My Own Bag) campaign every Wednesday, which encourages the habitual use of the eco-friendly SM Greenbag, the no plastic campaign in select supermarkets, and the biodegradable plastic bags of SM. Made from polypropylene, a non-toxic material, the SM Greenbag continues to highlight the importance of reusing bags, enlightening shoppers on the potential hazards of improper plastic bag disposal. SM has already saved approximately 26 million plastic bags through the campaign. Always stylish and practical, the SM Greenbag sports versatile new colors, black and green, easily matching most fashion styles. Now in two sizes that can adapt to different lifestyles and shopping needs, the SM Greenbag can be used by all members of the family for any occasion. In addition to this, SM also has a trash to cash program that runs twice a month in 41 SM malls that encourages you to sell your recyclables. To know more details, click here.